The winery was founded in 1910 by Polish immigrant Don Sami Flichman. He purchased property in Barrancas (southern Maipú) and planted vines in rocky, well-drained plots situated along the Mendoza river. It was Sami’s son Isaac who first began to make fine wine at the estate, including Caballero de la Cepa, one of the first high-quality wines that garnered international awareness for premium Argentinian wines. Sogrape Vinhos purchased Finca Flichman in 1998, and invested heavily in restoring the vineyards and equipping the winery with modern equipment. The original Barrancas vineyard remains among their 400 hectares of vines, which also includes the higher altitude Tupungato vineyard. Today the wines are made by Germán Berra, one of Argentina’s brightest talents, who was recognised as the ‘Best Young Winemaker’ in the Argentina Wine Awards in 2016. Germán works closely with consultant and renowned winemaker Alberto Antonini. 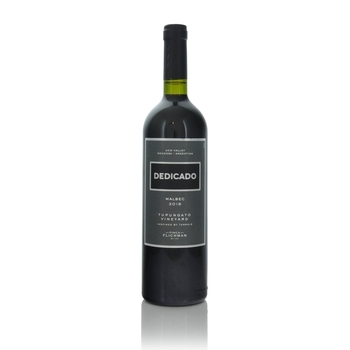 The Dedicado is made from the best hand-harvested fruit from the high-altitude Tupungato vineyards in the Valle de Uco. Terroir consultant Pedro Parra of Clos des Fous consults on the vineyards. Situated at the foot of the Andes, the vineyards benefit from large diurnal temperature variations which result in longer ripening seasons and more elegant wines. All grapes were hand-harvested. Fermentation was carried out over 15-20 days at a maximum temperature of 28°C. After malolactic fermentation took place, the wine was aged in oak barrels for 12 months - 50% in American oak, 50% in French oak. This wine bursts with aromas of ripe red fruits, plums and red currants, along with oak influences. It shows good concentration, and has a complex and persistent finish.